It was a busy fall at Evo. We actually turned some projects away because we could not get to them in the time frame required (which we hated to do, but not as much as we hate working 20 hrs/day for weeks to keep up with everything). We’d like to highlight four sites launched within the last couple of months, each of them using WordPress as a CMS. 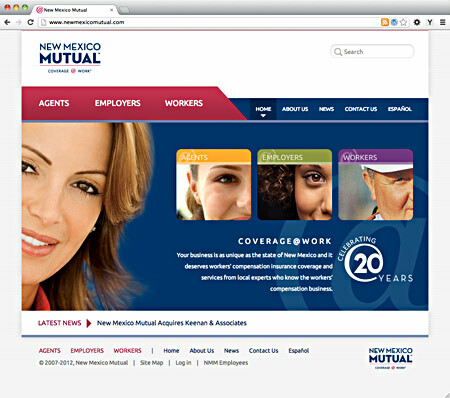 NMM’s website was designed by K2MD (formerly Kilmer & Kilmer) of Albuquerque specifically to use Evo’s evo5cms WordPress theme, which is the HTML5 version of our Evo4 CMS theme that we’ve used for a couple of years. Working with another designer always gives us a chance to stretch our ideas about what evo5cms can do, and this one is no exception: most people would be hard-pressed to see similarities between the site and other evo5cms sites. The site makes use of a “news” custom post type and has a membership system that handles access to protected site content. Compelling Cases is one of our oldest clients, and it was gratifying to finally move them to a WordPress site which allows them to directly manage their own content. Built on Evo4 CMS theme, the site includes custom post types and a lot of custom fields to make managing site content a breeze. We were also pleased with the ultra-clean look of the site, which presents content in an organized and uncluttered approach. SSTP’s new site replaced what might have been the last website on the planet to be made up entirely of images (all text set in PhotoShop). SSTP is very happy to have a website they can update directly, and the site includes just about every trick we know for enhancing WordPress as a content management system, making updates as quick and easy as possible. The site was designed to be compatible with the appearance of existing print collateral, and is built on the evo5cms theme. The most recent launch of the four is NMTC’s new website, built on BuddyPress, which is a WordPress “super plugin” that turns WordPress into a social platform. NMTC has done some significant work in creating connections among various tech industries, interest groups, and companies in New Mexico, and their new website is a tool that they hope will help them strengthen those connections and foster additional connections. This was our first experience with BuddyPress, which is a breeze to implement, but extremely complex to theme. We built a child theme on top of the BP Community theme. In addition, the site uses the s2Member membership plugin and Paypal Pro to handle membership purchases/renewals online. Also, of course, it utilizes custom post types and custom fields to simplify content management.